Opel CEO Michael Lohscheller, left, and PSA CEO Carlos Tavares aim to return Opel to profit. They are pictured next to an Insignia car at the Frankfurt auto show in September. FRANKFURT -- Opel's first business plan under its new French owners will set out how the German automaker will reach profitability that has eluded the former General Motors division since 1999. Deep cost-savings in production and purchasing, and the axing of some models to concentrate on high-margin segments, are expected at Opel, although the extent of how many jobs could be lost among Opel's 38,200-strong European workforce is not expected to be detailed, a source close to the automaker told Automotive News Europe. On the positive side, Opel will develop electric expertise for its new parent, PSA Group, Frankfurter Allgemeine Zeitung reported on Monday. It may also be allowed to sell cars in markets outside of Europe that it was previously barred from to avoid competition with sibling GM brands. 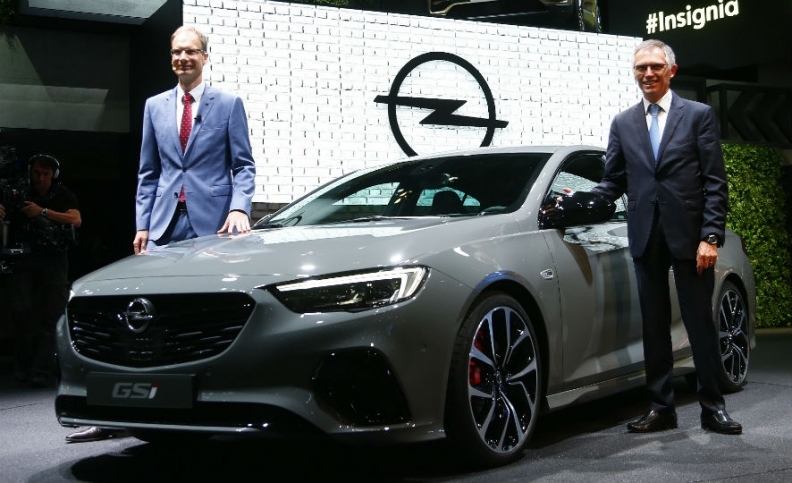 Opel CEO Michael Lohscheller, with PSA CEO Carlos Tavares at his side, will outline the turnaround plan at Opel's headquarters in Ruesselsheim near Frankfurt, on Thursday morning. Lohscheller has called the plan PACE, an acronym for Profitability and Performance, Agility and Accountability, Collaboration and Customer Focus, and Enablement and Empowerment, Germany's Bild newspaper reported on Wednesday. This would mimic Tavares' names for his first two restructuring plans at PSA - "Back in the Race" and "Push to Pass." Opel may update its profitability target of 2 percent by 2019, bringing it forward to 2 percent by 2020, German press reports have said. PSA's acquisition of Opel could potentially cost thousands of German and British jobs in the mid-term in a restructuring patterned on the Tavares' successful PSA turnaround. PSA has already said it will cut a quarter of the workforce at a plant in Ellesmere Port in northwest England that builds Opel and Vauxhall Astras. Tavares has criticized Opel's lack of efficiencies. "Conclusions certainly must be drawn when one sees that production costs at Opel are at least 50 percent above those of our French factories," Tavares told Germany’s Die Welt in a recent interview, adding PSA was opening its books and sharing best practices to show where organizational fat can be cut. Thursday’s announcement would be the first major decision from Lohscheller, who took over from respected CEO Karl-Thomas Neumann after five years in the background as finance chief. The former Volkswagen manager gave up his career at Opel’s larger rival after GM’s long-term investment plan for Opel convinced him the U.S. parent was prepared to stick with the brand over despite persistent rumors of a disposal. The need for cuts is undisputed. Together with its UK sibling Vauxhall, Opel posted an adjusted operating loss of $257 million last year on sales of 1.16 million cars due largely to headwinds stemming from a weaker UK pound. Despite the improvement of more than $550 million over the previous period, GM was forced to abandon yet another Opel breakeven target. PSA said in March it expects Opel to achieve a 2 percent operating profit margin in 2020, its first year in the black. By then the German subsidiary should also be able to stand alone financially, capable of funding the business through its own internally generated cash rather than relying on transfers from its parent. Opel's product lineup will shift from GM platforms to PSA architectures, enabling PSA and Opel to bundle purchasing activities and achieve savings and also help Opel to achieve fuel efficiency and CO2 reduction targets. Two of Opel's newest models, the Grandland X and the Crossland X, already use PSA platforms under a previous technology sharing arrangement between PSA and GM. PSA believes that by pooling operations like purchasing and development can achieve annual combined savings of 1.7 billion euros by 2026, allowing Opel to lift its profit margin to 6 percent that year. Eliminating duplication throughout the combined group could mean some of the combined 6,200 assembly line jobs in Ruesselsheim and its nearby component site in Kaiserslautern are in danger, but the real risks lie elsewhere. Its Eisenach plant in Germany is scheduled to start building the popular Mokka X small crossover in 2019. Tavares has however only agreed to honor rather than extend existing job guarantees for domestic employees that expire at the end of next year. If this was shifted to another site, it would leave Eisenach without any product to build, and make it an obvious candidate for closure. An even bigger problem however could be Ruesselsheim's technical development center where roughly 7,700 engineers are employed, constituting a fifth of Opel’s entire workforce, a relic of its days under GM. While GM focused on rolling out SUVs and pickups in the U.S., it left Germany in charge of global compact and midsize passenger car platforms. Tavares already has the capacity to design cars to meet European consumer tastes, leaving plenty of room to save money by lowering headcount in Germany. "PSA doesn’t have the luxury to wait when it comes to Opel, so I fear they will be more rigorous in their execution that GM ever was. That likely will mean a considerable reduction in engineering as development work leaves Ruesselsheim," said Hanover-based analyst Frank Schwope from NordLB. "One cannot however rule out a possible plant closure in high wage countries like Germany, the UK or Austria." One aspect can however be ruled out. Tavares has every interest in retaining Opel as a brand, admitting that some customers still prefer German cars to French ones. This could mean that Opel could play a key role in PSA's expansion efforts abroad. Not all analysts expect deep cuts because Tavares himself is best known for eliminating wasteful spending in an organization. While media reports suggest that Opel will no longer pay to have free cookies at employee meetings, this is merely an inconvenience compared with staff reductions. "Tavares wants to achieve the savings through purchasing, platform sharing and exporting cars to new markets, so I don't expect any plant closures or layoffs as long as Opel meets the 2 percent margin target for 2020," said Metzler Bank analyst Juergen Pieper.